Turkish President Recep Tayyip Erdogan met Saturday with his Russian counterpart Vladimir Putin, who expressed gladness over the normalization process experienced in Turkey after the July 15 coup attempt. Ahead of the G20 summit in China, the two leaders held a two-hour closed meeting at the Shangri-La Hotel in the coastal Chinese city of Hangzhou — their first since ties between Moscow and Ankara entered a new phase following an Aug. 9 meeting in St. Petersburg. Relations between the two countries soured last November after the downing of the Russian jet, which had violated Turkish airspace along the Syrian border. The issue seemed largely resolved June 29 through a letter and subsequent telephone calls between the countries’ leaders. Speaking to reporters before Saturday’s meeting, Erdogan stressed the importance of evaluating once again the issues he and Putin had addressed during their gathering last month. “We will have the opportunity to address many issues both political, economic and regional,” he said. Meanwhile, Putin said he was glad to see political life normalizing in Turkey following the July 15 coup attempt, which left 240 people martyred after Fetullah Terrorist Organization (FETO)-linked military personnel attempted — unsuccessfully — to overthrow the elected government. He said that despite Turkey facing trials, including the fight against terrorism, there were “significant achievements” in the country following the failed putsch. 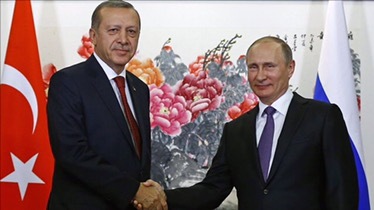 Putin had given his support to Turkey during the July 15 foiled coup and said he stood by the elected government in Ankara, offering his condolences to the victims of what Erdogan called the “most heinous” armed coup attempt in modern Turkish history. During Saturday’s meeting, Erdogan was accompanied by Deputy Prime Minister Mehmet Simsek, Foreign Minister Mevlut Cavusoglu, Economy Minister Nihat Zeybekci, Energy and Natural Resources Minister Berat Albayrak and National Intelligence Agency Chief Hakan Fidan. On Sunday morning, the Turkish President is due to meet with German Chancellor Angela Merkel at 03.30 GMT and United States President Barack Obama at 04.45 GMT. The 11th G20 summit, attended by the leaders of the world’s 20 most industrialized countries, will be held in Hangzhou in Zhejiang province Sept. 4-5.